Legume Show Cooking event with leading chefs! The conference will be hosted at the 5* Hotel Park (http://www.hotelparkns.com/en/), in Serbia’s second city, Novi Sad, which is a 1h coach drive from Belgrade airport. 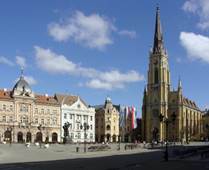 Novi Sad is an attractive tourist destination located on the Danube, with the 17th century citadel overlooking the town centre from the opposing bank of the river. technological development and demonstration under grant agreements no. 613551 and no. 613781.